A couple of months ago, I was asked by Sew It ...Today magazine to take fabric sent from Fabric Editions, and turn the yard of each of the 2 patterns sent into washable, sewn, fabric picture frames. 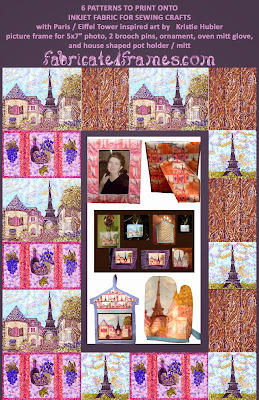 I used their fabric from "Fabric Loft - Trapeze" cotton / canvas collection. The patterns are called Chevron and Large Medallions. I made 1 frame for a 5x7" photo, 8x10" overall size, out of the Large Medallions pattern, and 1 frame for an 8x10" photo, 10x12" overall, out of the Chevron pattern. Both frames have a strut leg pocket and easel back pocket on the back, joined by ribbon at the bottom right of both panels, to allow for the frame to stand upright on a table or shelf. Both pockets have mat board parts slightly smaller, that slide in and out, and help give form to the frames, as well as allow for the frames to stand upright. On the front of the frame is a pocket for the photo and it's protective photo sleeve, which is cut from an acid free, clear sheet protector, which you can find at any office supply store, Target, Walmart, Walgreens, etc. Just make sure that it is clear, not translucent clear with a tooth, just smooth absolutely clear, and that the words acid free are on the packaging. 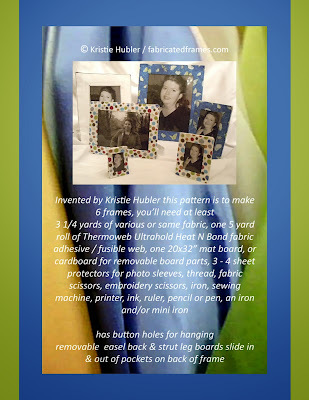 I also use Thermoweb fusible web, as the patterns of all of the parts of the frame. 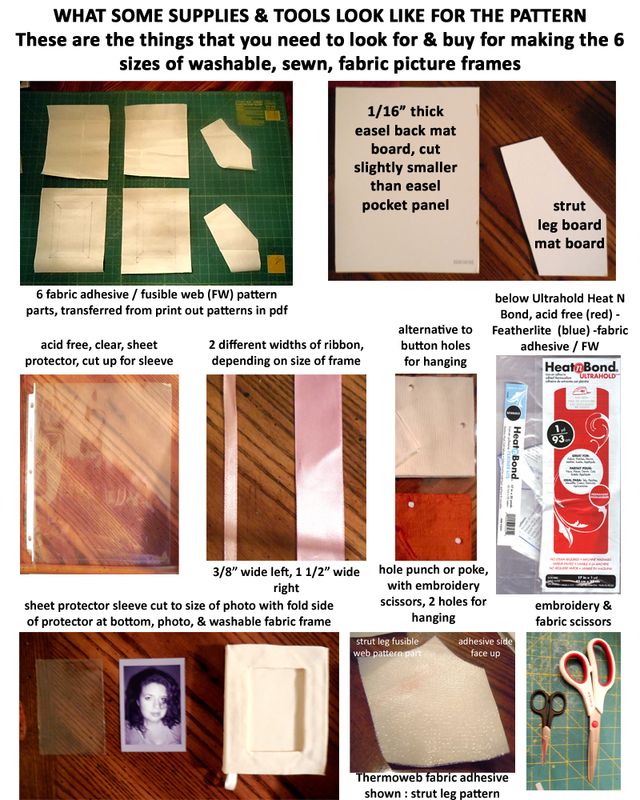 This is a peel away paper backed, iron on, fabric adhesive, that I cut to the size, and these pieces get ironed on to 6 out of 10 of the slightly fabric panel pieces. I use the acid free Ultrahold Heat N Bond type, but the President of Thermoweb suggested that I should use either the Heat N Bond Lite or Featherlite types. If a crafter / sewist / seamstress / quilter / designer decides to use the Ultrahold type, which I have used for 14 years, and have sewn with for 9 of the 14 years in my frame projects / products, just lower the stitch length to 3, and go slowly around your pieces. If you want, you can slowly and neatly go around your first stitch line another time. Use a denim weight sewing machine needle. Thermoweb also offers a brand new product PERFECT for this frame project, called "EZ Print" sheets, available here. 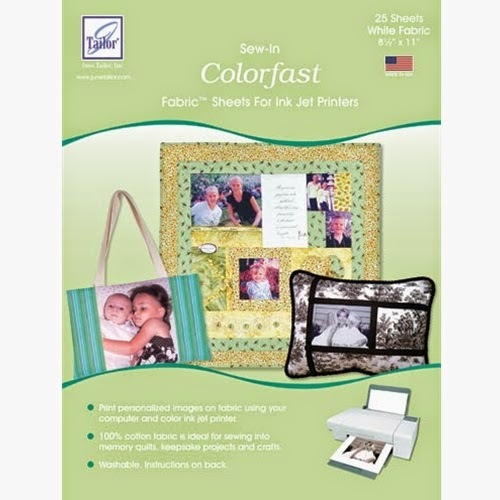 They are pre-cut, double paper sided Heat N Bond Lite and Featherlite fusible web, cut to 8 1/2" x 11", that you can run the patterns directly onto the EZ Print sheets, instead of printing out the patterns onto inkjet printer paper, and then transferring the lines onto the Thermoweb, sold by the yard or on a 5 yard roll. The 10 sheet pack costs $7.99, and one pack is perfect for each size picture frame. OR you can buy it by the 5 yard roll for as little as $5 from Michaels, $10 per 5 yard roll, minus a Michaels 50% off store coupon, which can make it economical, if you do it that way. Your choice. FabricatedFrames.com is a featured partner of Thermoweb. 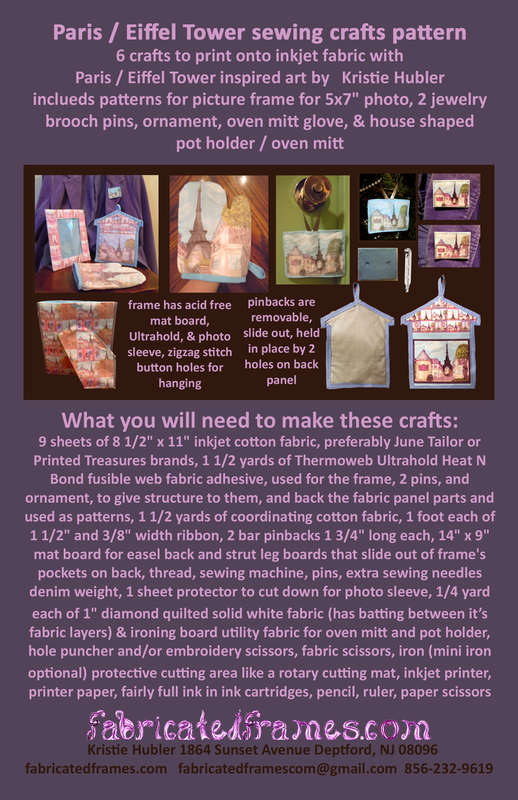 You can also make oven mitts, potholders, even bellybands for all kinds of dogs. 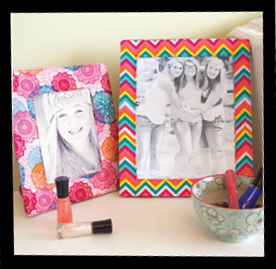 The frames are a great project for older tweens and teens who want to sew picture frames for friends and family. 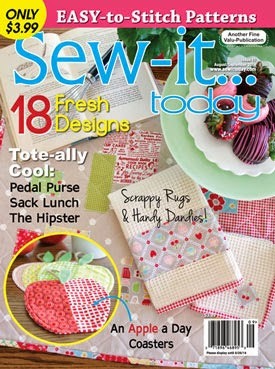 For now, until the issue comes out 1 week from today, next Tuesday, you can preview the issue contents at Sew It Today's site, and view my designer profile here. Craftsy is a great place to buy pdf patterns, those printable patterns that you can print out, and use over and over again. My pdf patterns, once you buy them, are downloaded directly from Craftsy, and are affordable at $1 & $5, depending on how much you get in each pattern. 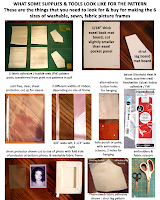 which are then transferred onto Thermoweb Ultrahold acid free or Featherlite / Heat N Bond Lite fusible web, a paper backed, peel away adhesive that you iron onto the backs of your fabric pieces and use as a pattern for the finished fabric parts. Ultrahold and Heat N Bond Lite are available here, or in Michaels for $5 after you use their 50% store coupon, or AC Moore for the 5 yard roll. Available at Joann's by the yard $1.99 before using store coupons or if on sale. 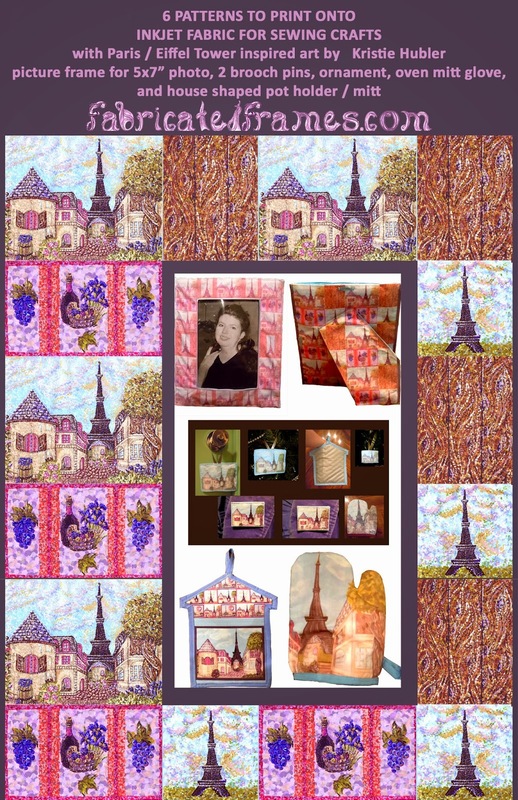 and some can be directly printed onto Thermoweb EZ Print sheets, that are 8 1/2" x 11" fusible web, an fabric adhesive substrate, with peel away paper backing that you iron the backs of your fabric pieces and use as a pattern for the finished fabric parts. EZ print sheets are $7.99 for 10 sheets available here. I am thinking about selling my art to print onto cardstock for cards or to print 8x10 versions for frames, as printables. I keep everything fairly cheap because I know crafters, sewists, seamstresses, designers, and quilters are having to spend money on tools and extra supplies, so I keep the patterns cheap, and I also advice how to buy the tools and supplies as cheap as possible, so you get more bang for your buck, plus I'm promoting the craft, fabric, and sewing, vendors / suppliers that I use in the process.